UEM Land Holdings Bhd managing director/CEO Datuk Wan Abdullah Wan Ibrahim (right) and finance, corporate affairs and investments director Mohd Zakir Omar (left) at a briefing after the AGM on June 16. KUALA LUMPUR: UEM Land Holdings Bhd has set a headline key performance indicator (KPI) target to achieve 50% year-on-year growth in revenue to RM1.66bil and 10% return on equity this year. “The headline KPI numbers are our aspiration goals,” managing director and chief executive officer Datuk Wan Abdullah Wan Ibrahim said after the company's AGM yesterday. He believed the target was “very achievable”, given the combined financial performance of UEM Land and its newly acquired wholly-owned subsidiary, Sunrise Bhd. “With the acquisition of Sunrise, we are the biggest property player in terms of market capitalisation. 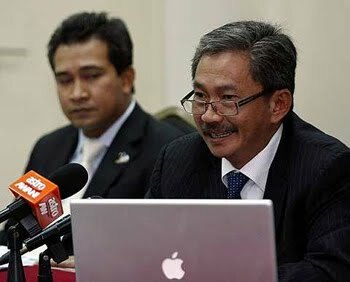 But we do not have the earnings to show yet but we hope to surpass our competitors in the near future,” Wan Abdullah said. He added that based of the first few months of this year, UEM Land was “on track” to achieve its target. Wan Abdullah said UEM Land was unable to realise its headline KPI for FY10 in terms of revenue growth, although the company managed to achieve its sales target, as it failed to recognise its income due to various reasons. UEM Land has an unbilled sales of RM1.5bil which will be realised over the next two years. For the financial year ended Dec 31, 2010, it posted a net profit of RM194.5mil on revenue of RM469.7mil. UEM Land plans to launch properties with a gross development value (GDV) of RM5bil this year. “We are building up a portfolio. We have enough projects in the pipeline for us to catch up,” Wan Abdullah said. SUBANG JAYA: Property developer UEM Land Holdings Bhd will start marketing properties with a potential gross development value of RM5 billion this year. Chief executive officer Wan Abdullah Wan Ibrahim said UEM Land has unbilled sales of RM1.5 billion that will be realised in the next two years. He said the group is also on track to achieve its internal target to record 50 per cent growth in revenue this year. "This will be coming from a combined result of UEM Land and our subsidiary group Sunrise Bhd. So it is very achievable," Wan Abdullah said at a media briefing after the group's annual general meeting yesterday. Last November, UEM Land merged with Sunrise in a RM1.39 billion deal which created Malaysia's largest property company with a market capitalisation of nearly RM10 billion and 4,860ha of land. The acquisition was completed on February 16. The group's net profit for the first quarter ended March 31 jumped 460.34 per cent to RM17.60 million, while revenue soared by 372.77 per cent to RM187.68 million. Yesterday, its shares closed unchanged at RM2.78 with some 6.4 million units traded. UEM Land hopes to surpass revenue performance among its peers by building its portfolio through launching of new property projects. In the pipeline is a high-rise residential Imperia at Puteri Harbour, Nusajaya, which will take off this year and a RM2.84 billion freehold township project in Bangi, which it hopes to launch by the second quarter of next year. Its ongoing residential projects are East Ledang, Horizon on Hills, Nusa Idaman, Nusa Bayu and Symphony Hills in Cyberjaya, which is the group's first project located outside of Nusajaya. Wan Abdullah said the company is keen to be a regional player tapping Sunrise's market presence via its property development projects in Vancouver, Canada. Sunrise also has property interest in Australia, South Africa and the UK via joint ventures with overseas partners. "We are looking to expand overseas, but we will go there through partnerships," he added. JOHOR BARU: A new specialist hospital on a 500,000 sq ft of land will be built in Bandar Dato' Onn in the Iskandar Malaysia development region in Johor Baru. Specialist hospital operator KPJ Healthcare Bhd will collaborate with Johor Land Bhd to build the modern hospital. The project will be undertaken in two phases, KPJ chairman Kamaruzzaman Abu Kassim said yesterday. The hospital will have the capacity of 400 beds, encompassing 280,000 sq ft. The first phase of the construction with 150 beds, is expected to start by the end of 2012. Its total invesment has yet to be determined, but an average of RM1,000 is budgeted for a bed. "Approval for zoning has been obtained from the Health Ministry and the details are being finalised," Kamaruzzaman said. Kamaruzzaman, who is also Johor Corp chief executive and president, said the new hospital will house a "Centres of Excellence" featuring a heart centre, a geriatric centre, cancer centre and a cosmetic and reconstructive centre, among others. "It will serve as a one-stop centre for all medical services of the highest standards to cater to both local and foreign patients to promote health tourism," he told a press conference yesterday. At the same time, the group is currently developing new specialist hospitals in Bandar Baru Klang, Muar, Pasir Gudang and Kuantan. 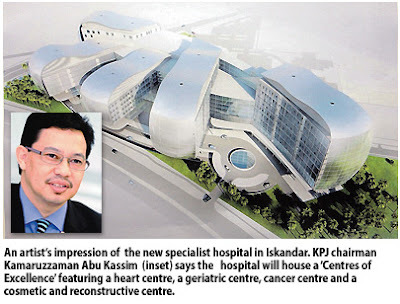 KPJ is investing between RM50 million and RM80 million for each hospital. It recently completed a deal to buy Sibu Specialist Medical Centre and Sibu Geriatric Health and Nursing Centre in Sarawak at RM28 million on April 6. Kamaruzzaman expected the new project in Bandar Dato' Onn to further sustain its consistent financial growth in the coming years. For the year ended December 31 last year, KPJ posted a total revenue of RM1.65 billion, up 13 per cent, compared with RM1.46 billion previously. Group pre-tax profit improved16 per cent from RM143.89 million to RM166.69 million. On another note, KPJ is venturing into the retirement and aged care market following its agreement to buy 51 per cent interest in Australian operator Jeta Gardens Waterford Trust for RM19 million. The deal is expected to be completed by September this year. "There is a huge market for retirement and aged care. We are in the midst of studying the business and is planning to build several retirement villas around the country," Kamaruzzaman said.